Make a saving on some of our favorite board games. If you haven’t tried Gloom, Pandemic, or Betrayal at House on the Hill yet, you really should. They’re some of our favorite board games, and the good news is that Amazon’s currently selling them for less than normal. 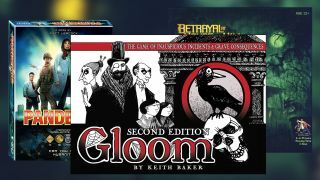 For example, you can get a $10 saving on Gloom (making it $15) and 44% off Betrayal. Considering how innovative and replayable these are, we’d highly recommend giving each game a go. For those who are unfamiliar with it, Gloom tasks players with making a Tim Burton-esque family of characters so miserable they die in ridiculous ways (like being eaten by weasels). As for Betrayal at House on the Hill, it’s a horror game which features a modular board, potential traitors among your team, and multiple unique scenarios that provide a very different experience every time you play. Last but not least, Pandemic is focused on co-op; you’ve got to cure various diseases before they overwhelm society. They’re all very different, but each one’s a brilliant way to spend time with friends. Looking for more recommendations? Visit our list of the best board games money can buy. Alternatively, drop by our guide to the best co-op board games.